We are Joanne Sanderson and Kevin Page and we live in the beautiful seaside town of Whitby, North Yorkshire. The golden sandy beach at Whitby is just a ½ mile walk from our home with the North Yorkshire Moors just a short distance away. 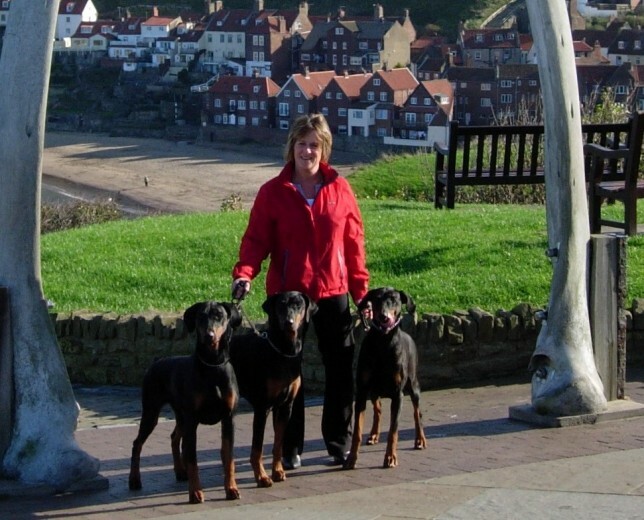 Joanne got her first Dobermann Bella, in 1984 and fell in love with the breed. As a couple we got our first dobermann Bud in 2001 followed shortly afterwards by Stella in 2004. Stella had an excellent pedigree and outstanding temperament so in 2006 we decided to look for a suitable stud dog to breed from her. Our first litter was born in 2007 and that was the start of Jodaseen Dobermanns. We currently have three dobermanns Hugo, Asia and Darcy. Hugo joined us from the Aritaur Kennel in 2011. We show Hugo who has gained his Champion title. Hugo is the father of Asia who we obtained from the Jaktay Kennel in 2014. We also show Asia who has gained her Junior Warrant and Show Certificate Of Merit titles. In 2018 Asia had a litter of 12 puppies sired by Sant Kreal Focus on Korifey iz Supeta. Darcy was our pick of the litter with the intention of showing her. All our dogs are pets first and foremost. Our puppies are only placed with very carefully chosen families. We know where all the dogs we have bred are, and remain in regular contact with their owners. Thank you for visiting Jodaseen Dobermanns. The website will grow as our kennel grows.